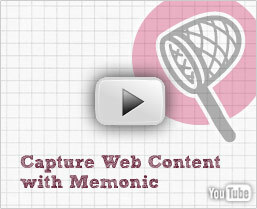 The Memonic Web Clipper lets you capture content snippets on any web page. Below are all the browsers we support. If you have a different browser than those above, the bookmarklet may still work. Need a little extra help? Watch our How-to video. It's only one minute long and explains how to save web content.